A handful of the many talented FYP students who took part in the Action Point Annual Award. 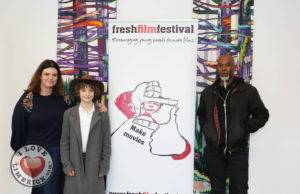 Far right is John Savage, CTO ActionPoint and far left is Damian Lee, Senior Project Manager, ActionPoint. 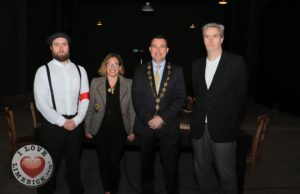 Limerick-based Tech Firm Action Point awarded UL Computer Systems student Jonathan Lloyd first prize for its annual FYP award in conjunction with UL on Monday, April 9th. 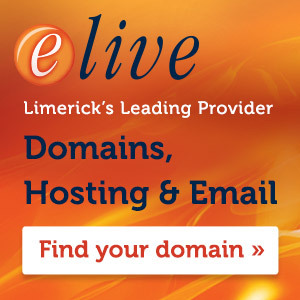 The award, which has been running since 2014, looks for excellence in commerciality and innovation in computer science final year projects and is open to all 4th-year students of Computer Science and Information Systems (CSIS) degrees at UL. 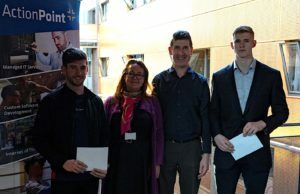 Projects in 1st and 2nd place are awarded cash prizes, following evaluation from a five-judge panel made up of senior members of ActionPoint’s engineering team. Jonatan Lloyd’s FYP was a ‘License Plate Recognition’ system and was commended by ActionPoint’s judges because of its “clean architecture and functionality”. The Judging panel also commented on the “efficiency gains” that this system can offer over existing technology. Mallow native Keith O’Brien claimed 2nd prize and €250 for his Intelligent ‘Horse Racing Predictor’ system. 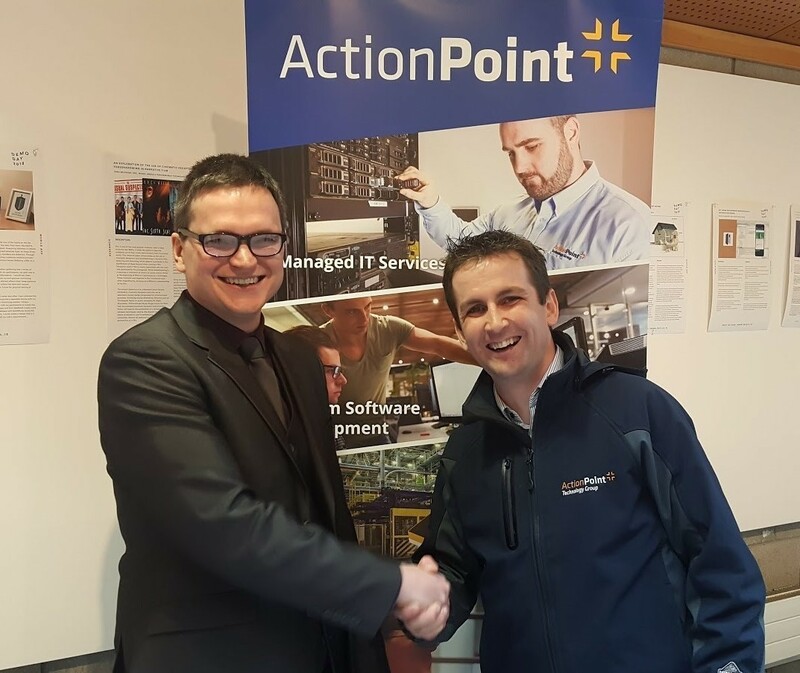 ActionPoint was founded in 2005 by UL CSIS graduates John Savage and David Jeffreys, who were both awarded the prestigious UL Alumni award in Autumn of last year. 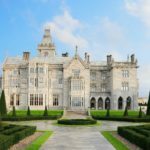 John Savage, ActionPoint co-founder, and CTO have fond memories of his own FYP, having developed an open framework for VR which won national awards from HP and Accenture, as well as the QAD Design Competition. John went on to win the President’s Gold Medal in 2001. 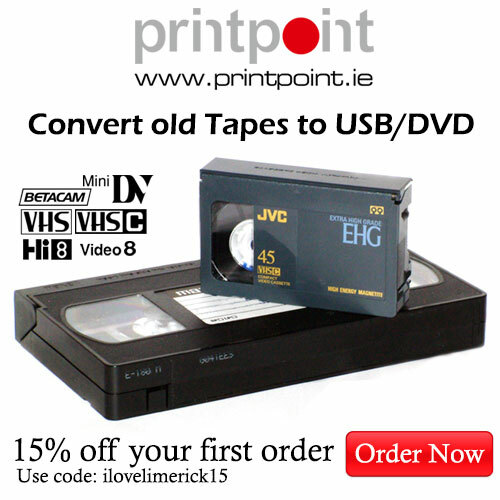 ActionPoint currently employs close to 100 people at it’s Limerick HQ and has offices in the UK, Europe, and the US. 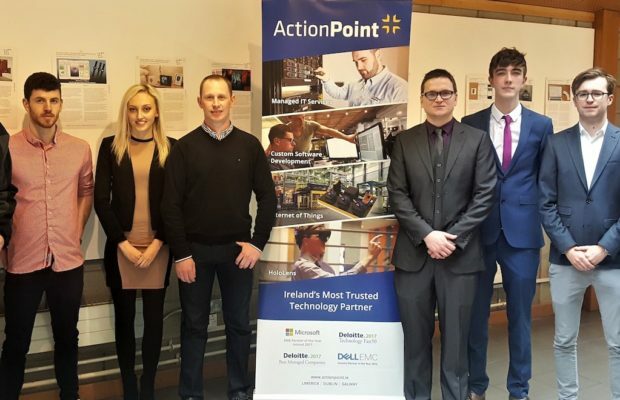 ActionPoint is a Microsoft Gold Partner, Dell Country Partner of the Year 2014 and 2016 and has won the Deloitte Fast 50 award for the past four years in a row. ActionPoint were also awarded Deloitte Best Managed company status for the second year running. For more stories on Action Point, go here. For more information on Action Point Annual Award, go here.